Ira Wallace is a worker/owner of the cooperatively managed Southern Exposure Seed Exchange (www.SouthernExposure.com ), which offers over 700 varieties of open-pollinated heirloom and organic seeds selected for flavor and regional adaptability. Ira serves on the boards of the Organic Seed Alliance, the Organic Seed Growers and Trade Association and the Virginia Association for Biological Farming. 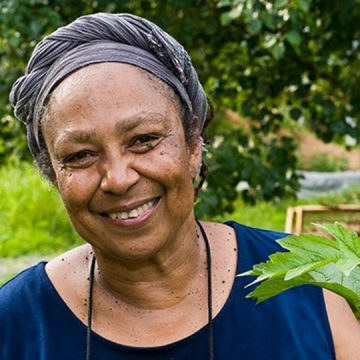 She is a member of Acorn Community, which farms over 60 acres of certified organic land in Central Virginia. Ira is an organizer of the Heritage Harvest Festival at Monticello (www.HeritageHarvestFestival.com), a fun, family-friendly event featuring an old-time seed swap, local food, hands-on workshops and demos, and more. She also writes about heirloom vegetables and seed saving for magazines and blogs including Mother Earth News, Fine Gardening and Southern Exposure. Her book, “The Timber Press Guide to Vegetable Gardening in the Southeast,” is available online and at booksellers everywhere.